Race Review: Shape Run 2016 [10 km] (by Rebekah Ong) | JustRunLah! 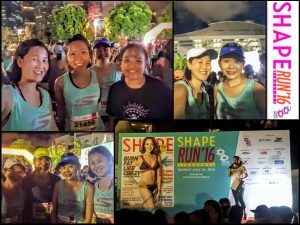 SHAPE Run is Singapore’s first all-women race and it has always been a yearly event for me except for the time that I was studying overseas. 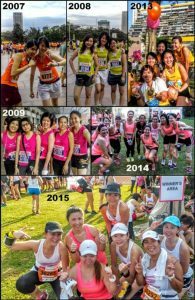 I’ve participated in the 2007, 2008, 2009, 2013, 2014 and 2015 editions and I had fond memories of these events. What I excites me to join SHAPE Run every year has got to be the event tee and the goodie bag! 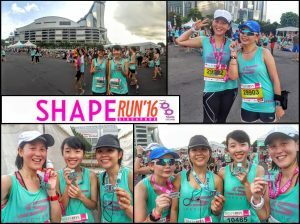 I always love their run tees as they give you that girlish sporty feel and they are super pretty! The goodie bag are always filled to the brim with freebies and not just flyers and coupons!! This year is no exception! 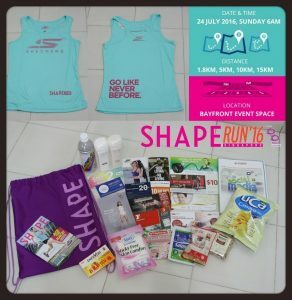 The run tee is a cute turquoise green with pink wordings and the goodie bags are filled with goodies that every lady would find useful and essential. Check out my photo below! This year is the first time I’m taking part in the 10km category as compared to other years where I just participated in the 5km. 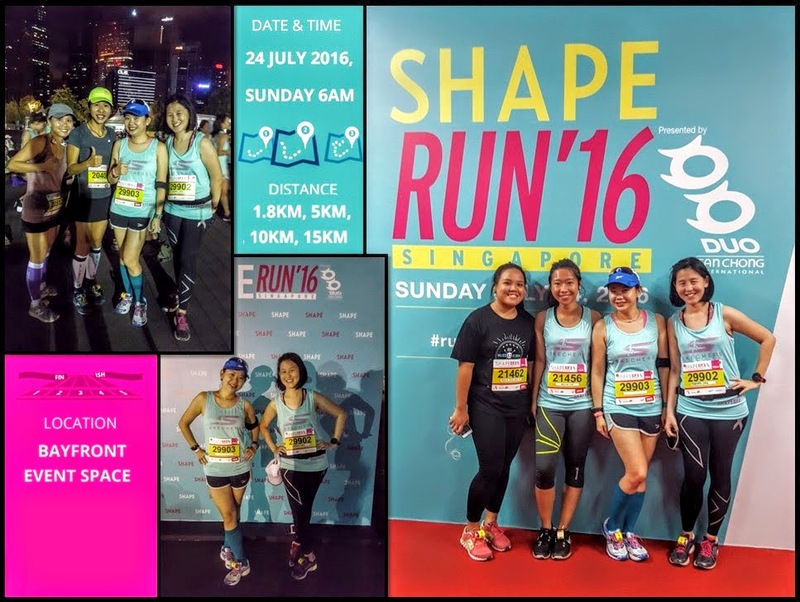 This year’s event was held at the Marina Bay Event Space and the flag-off for the 10km category was at 06:45 hrs. As with all early flag-offs, all of us had to wake super early and take a cab down to the event site! We reached the event site at around 05:50 hrs and we had ample time to eat our breakfast, hydrate ourselves, drop our bags off, snap some wefies and use the toilets. I think among all the SHAPE runs, this is the best event site! It was spacious all around and super convenient to access. We promptly headed for the START pen at 06:15 hrs. It was really nice to have a familiar voice, Charmaine Yee, from my all time radio station, Kiss 92 FM on stage welcoming everyone! Love the energy that she brings when she is emceeing! 15 minutes before flag-off, Charmaine handed over the stage to Joeson Yeo from TRUE Fitness who conducted a simple aerobics warm up session! He was very engaging and both me and Cheng Yee were instantly reminded of our gym exercise class days. We did the warm-up routine with energy but it was a tad squeezy at where we were standing but still we enjoyed the warm up! 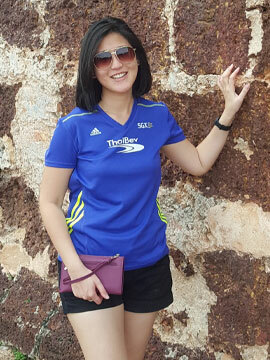 As soon as warm-up was done, Charmaine took to the stage again and introduced the flag-off party and we were promptly flaged-off on our 10km route! 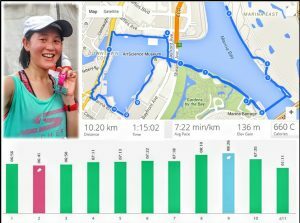 This years route was a familiar one for me because this is one of my favourite places that I would do my weekly workouts. 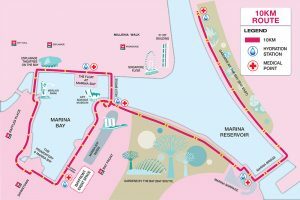 It’s a really scenic route that brings you past our awesome Singapore skyline, Gardens By the Bay, to our Marina Barrage area, next to Gardens By the Bay (East), and back to the Double Helix Bridge, past the Floating Platform and back to the FINISH area! There were definitely a few small slopes but it was all good! 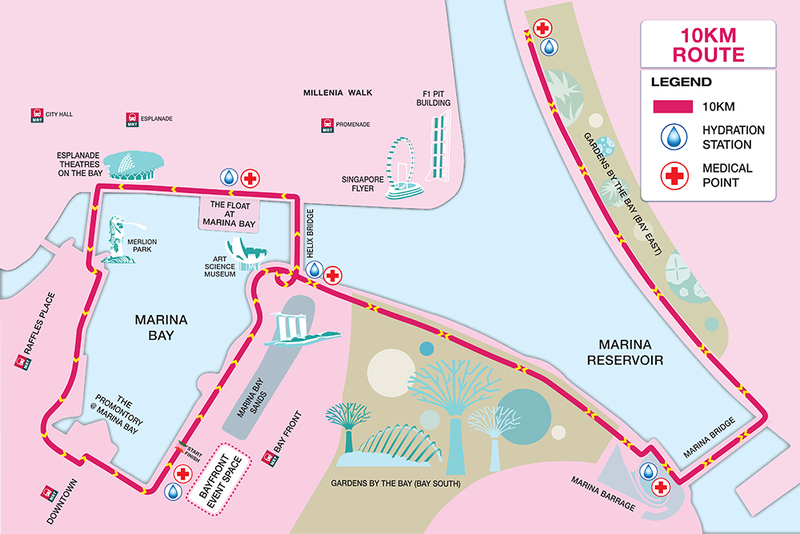 There were no bottlenecks for the first 8km but after the Esplanade, it started getting crowded as all the race categories were heading back to the FINISH point. 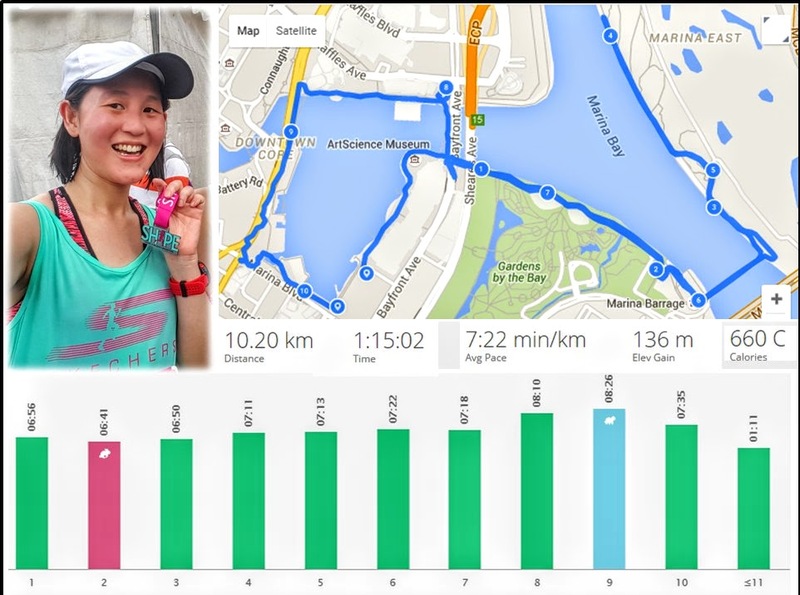 The weather this morning was fantastic and water points with both plain water and H2O were sufficiently distributed all along the route which made it very helpful to participants as Singapore has a humid climate! I finished the run event with an unofficial timing of 1 hr 15 mins (See photo above)! Medal collection was really fast and smooth! 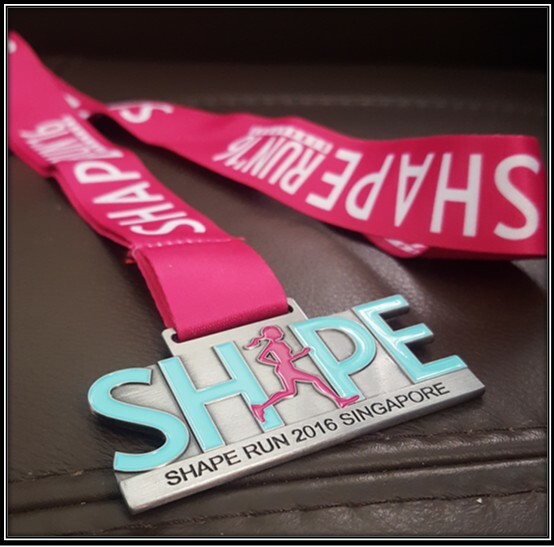 I really like the design of this years medal! At least it has some colour as compared to the other years (See photo below). Once we have cooled down, my friends and collected our stuff from the baggage counter! We just walked around to check out what the vendors were offering and took some post race wefies! I must say that SHAPE has one of the best after race expo! 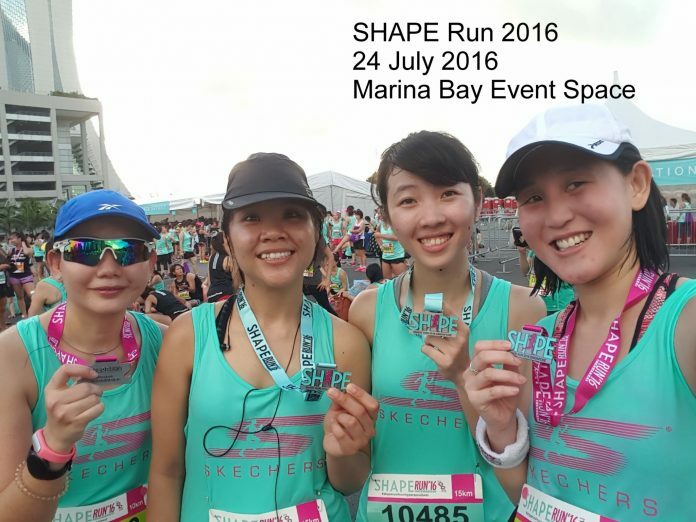 Overall it was a enjoyable and well organised run event! Great job SHAPE Singapore and Esprimo! I’m just looking forward to the official results and race photos by the various photography groups! 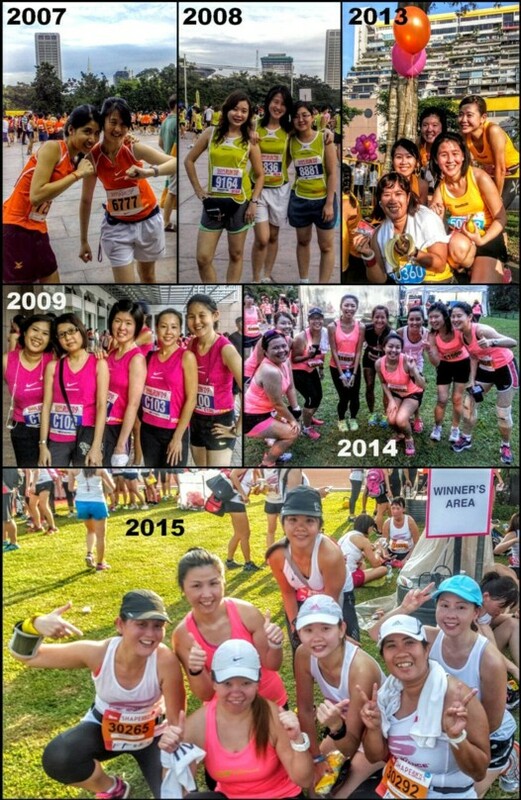 Till my next race review, congrats to all the ladies on completing today’s event!